Luke Gale, try and two goals against Wigan. 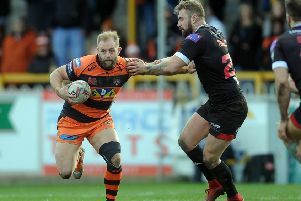 Castleford Tigers’ Wembley dreams were shattered as they paid for a poor first half display in a 26-12 defeat to Wigan Warriors at the DW Stadium. In front of a massive away following Daryl Powell’s men were second best in the opening 40 minutes and although they were much improved after the break they left themselves with too much to do. There was little of the controversy that marred the previous meeting of the two teams at the Mend-A-Hose jungle, but Wigan were awarded a joke try in the second half after Dom Manfredi clearly missed the ball chasing a kick through yet was awarded the score by on field referee Chris Campbell and video referee Robert Hicks. That proved just about the biggest talking point as the game never really caught fire and was effectively over as a contest with the Warriors 22-0 ahead at half-time. Cas were behind from the fifth minute when they were caught for numbers on their left and Wigan moved the ball simply for Dan Sarginson to go over in the corner. Matty Smith added the touchline goal and the Tigers were quickly 6-0 down. They came close to replying as Luke Dorn was tackles inches short of the home line and Ben Crooks was held up over the line shortly after. But it was Wigan who showed they were more clinical when Sam Tomkins took advantage of a weak attempted tackle by Grant Millington to charge in for the home team’s second try, again converted by Smith. Cas again forced some pressure and had chances to hit back, particularly when they worked the ball left to Denny Solomona only for the prolific scoring winger to be stopped on this occasion. The video referee confirmed no try, but gave the Tigers a penalty for a shoulder charge on Dorn as he sent out the final pass. But they could not take advantage, although Gale’s grubber kick did force a drop-out. Wigan made it three attacks, three tries on 29 minutes as Josh Charnley was allowed to burrow over from close range with Joel Monaghan and Crooks unable to stop him on the line. Smith’s goal made it 18-0. A fourth home try followed with Charnley squeezing in at the corner for his second try. Smith was not able to goal, but it was 22-0 and that was how it stayed to the interval. Cas came out early for the second half after a talking to from head coach Powell and were immediately stronger all round the pitch. Greg Minikin, drafted in just before kick-off for the injured Jake Webster, created a chance with a good break only for his attempted pass inside to Solomona to go to ground off a Wigan player’s hand. Solomona attempted to slide in at the corner soon after, but the video referee deemed no try after he appeared to knock-on inches short of the line. Gale’s high kick was well taken by Manfredi under pressure from Solomona and Wigan’s line stayed intact. Cas finally got on the scoreboard on the hour as Junior Moors made a break and Gale backed up to score a try he quickly converted. But any chance of a comeback was snuffed out five minutes later as Wigan were given their joke try after Dorn missed a kick through and Manfredi missed the ball attempting to dive on it over the line only to be surprisingly given the points. To the Tigers’ credit they did keep trying and came close again when Adam Milner’s grubber unluckily kick hit the post with players free who were chasing up. It summed up their day as the ball bounced kindly for Sam Tomkins and he got away with juggling it. But just before the final hooter Cas were rewarded as Monaghan offloaded in a tackle on the touchline and Crooks backed up to score. For whatever reason video ref Hicks took an age to confirm the score and Gale added the touchline conversion. However, it was all over and Castleford had not repeated their quarter-final successes of the past in Wigan. Scorers - Wigan: Tries Sarginson, S Tomkins, Charnley 2, Manfredi; goals Smith 3. Castleford: Tries Gale, Crooks; goals Gale 2. Wigan Warriors: Wigan team: S Tomkins; Charnley, Sarginson, Gildart, Manfredi; Williams, Smith; Mossop, Powell, Flower, Sutton, Isa, O’Loughlin. Subs: J Tomkins, Tautai, Burke, Bretherton. Castleford Tigers: Dorn: Monaghan, Crooks, Minikin, Solomona; Millington, Gale; Jewitt, McShane, Patrick, Moors, McMeeken, Massey. Subs: Milner, Tickle, O Holmes, Cook.